World champion Dennis Orcullo went undefeated to capture his first Space City Open 9-Ball title, besting Ohio’s Shane Winters in the final set, 9-4. 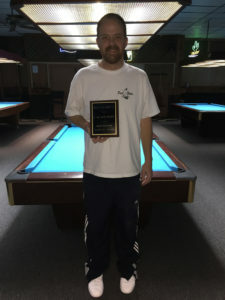 In the one pocket division, Chip Compton overcame Jeremy Jones, 3-1, 3-1, taking home his first title, and Jones captured his second, consecutive, 9-ball banks title, outlasting Orcullo in overtime, 3-2, 3-0. Wrapping up the event, Gail Eaton overcame Kia Sidbury in the ladies 9-ball finals, 7-4, 5-2. 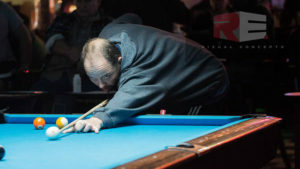 The 4-day, 4-division, Space City Open IV (SCO) was held at Bogies Billiards and Sports Bar in Houston, Texas, December 3rd-6th, 2016. In its fourth year, SCO continues to increase in talent and value, and professional players from across the U.S. flew in to take advantage of a payout exceeding $56,000. New blood included Dennis Orcullo, Shane Winters (OH), Shane McMinn (TN), Jerry Calderon (FL), Mike Massey, and Tony Chohan (MI), who along with more than 120 players, entertained a packed house and hundreds of at-home viewers tuned in to the HD live stream provided by OnSitePoolNetwork.com. Everyone in Texas knows the place to be during the first week of December is the Space City Open. 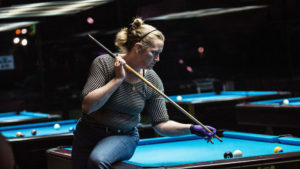 The annual event has showcased some of the greatest billiard talent in the U.S., including U.S Open Champions, World Champions, and Mosconi Cup team players. The SCO is a serious competition and players mean business, which makes for an intense, competitive environment, and great entertainment for the fans. Without a doubt, this was the toughest SCO 9-ball division to date, and simply losing the flip could cost a player the set, in this winner break, rack your own format. 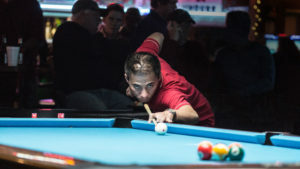 In the 101-player 9-ball field, the famed Dennis Orcullo won 8 consecutive matches on his way to the hot seat, defeating Robert Cruz, 9-1, Jonathon Romero, 9-0, Vu Pham, 9-3, Charlie Bryant, 9-4, Shane McMinn, 9-8, and Sylver Ochoa, 9-5. Jerry Calderon won his bid for the hot seat with wins over Cliff Joyner, 9-6, Alex Cardenas, 9-1, Richard Hughes, 9-1, Joey Gray, 9-1, Shane Winters, 9-3, and Tom Mooney, 9-5. After a 9-7 upset by Tom Mooney in the first round, Tony Chohan won an incredible 7 consecutive matches with wins over Ernesto Bayaua, 7-3, Jeremy Jones, 7-4, Gabe Owen, 7-6, and Abel Lara, 7-5. Other upsets included John Lassek over Jamie Baraks, 9-6, and Abel Lara over Mike Massey, 9-6. 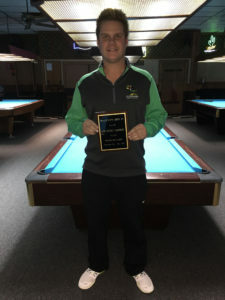 New Mexico’s Tommy Tokoph lost his first round to Winters, 9-6, but came back strong with 6 wins, along the way, eliminating two-time 9-ball champion, Charlie “Hillbilly” Bryant, 7-3. Winters ended Tokoph, 7-3, and made quick work of Ochoa, 7-1. After a fourth round loss to Winters, 9-8, Robb Saez ousted defending 9-ball champion James Davis, Jr. with a quick 7 pack, Baraks, 7-5, and McMinn, 7-2. Chip Compton, who suffered an earlier 9-5 loss at the hands of Ochoa, eliminated Jamie Farrell, 7-3, but fell to Saez, 7-6. Saez bested Mooney, 7-2, for a rematch with Winters. Once again, Winters advanced, 7-3. Back on the east side, the hot seat match commenced with Orcullo and Calderon. Orcullo played near flawless, and unforced errors on Calderon’s part sealed his fate. Orcullo closed the set out, 9-4. Winters anticipated a shot at redemption, and now it was here. This time, Calderon stepped up to the plate, only to be struck out by Winters, 7-5. In the final, both players came out of the gate running, but Orcullo proved too much for Winters, ending the race, 9-4. 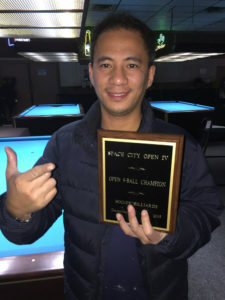 Congratulations to Dennis Orcullo on his first SCO 9-Ball title. The 40-player one pocket field (limited to 40) featured an all-star cast with phenomenal talent going head to head in a test of wills and stamina. Oklahoma’s Chip Compton made his way through the winners’ side with wins over Joe Pelayo, 3-0, Jon Demet, 3-0, Shane McMinn, 3-0, and James Davis, Jr., 3-1, while Jeremy Jones bested Tony Chohan, 3-1, Robb Saez, 3-2, Denis Strickland, 3-0, and Joey Gray, 3-1. On the one-loss side, Chau took out Saez, 3-1, but fell to Joey Gray, 3-1. Again, Chohan was on a roll with 6 consecutive wins, including victories over Tommy Tokoph, 3-1, Ernesto Bayaua, 3-1, Chase Rudder, 3-2, Gabe Owen, 3-0, and James Davis, Jr., 3-0. On the east side, Compton defeated Jones for the hot seat, 3-1, while Gray ended Chohan’s run, 3-0. Gray fell to Jones, 3-1, pitting a rematch between Jones and Compton. A focused Jones stepped up to the final table with the intent of taking back what he had lost. Compton knew he couldn’t let this one get away, but as the first set came to a close, it was Jones who came out ahead, 3-1. In the second set, Compton remained composed, his mind on the task at hand. Compton defeated Jones in the final set, 3-1, to capture his first SCO One Pocket title. 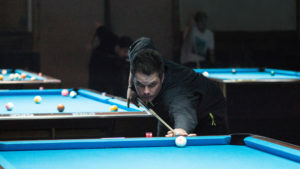 Kicking off Space City Open IV was Thursday’s 29-player, 9-ball banks division. Again, it was Orcullo, attempting to go undefeated with wins over Richie Richeson, 3-0, Luke Sutliffe, 3-0, Tommy Tokoph, 3-1, and Shane Winters, 3-1. Gabe Owen took down Chase Rudder, 3-1, Sylver Ochoa, 3-0, Shane McMinn, 3-2, and Manny Chau, 3-2. Following a loss to Winters, 3-1, Cliff Joyner eliminated Tom Mooney, 3-0, James Davis, Jr., 3-2, and McMinn, 3-1. After suffering a loss to Winters, 3-0, Robb Saez eliminated Jamie Farrell, 3-1, but fell to Jeremy Jones, 3-1. Jones eliminated Chau, 3-1, earning himself another shot at Chohan, the player who had sent him to the one-loss side by a score of 3-1. Jones wasted little time exacting his revenge, taking out Chohan, 3-1. On the east side, Orcullo and Owen teed off for the hot seat, Owen coming up short, 3-1, and again with Jones, 3-1. Jones captured the first set of the true double elimination final, 3-1, finishing Orcullo off the second set, 3-0, earning his second, consecutive banks title. Due to a hand injury, it was uncertain if Jones would compete in this year’s SCO. However, Jones competed in all three divisions, with a very swollen hand to show for it. Congratulations to Jeremy Jones on successfully defending his banks title! Rounding out the event, 22 women battled it out on Sunday for almost $2,300 in cash in the ladies 9-ball division. WPBA player Kia “Primetime” Sidbury (MD) made her way to the hot seat, defeating Veronica “Pistol” Perez, 7-0, Terry Petrosino, 7-1, and Robyn Petrosino, 7-4. Natalie Rocha made an impressive run, ousting Erica Nicole Walker, 7-1, Gail “Virginia Slim” Eaton, 7-5, Linda Garza, 7-1, and Marie Rodriguez, 7-0. On the one-loss side, Eaton ran through D’Andrea McQuirter, 5-1, Ginger Abadilla, 5-2, Terry Petrosino, 5-1, Belinda Lee, 5-0, and Rodriguez, 5-3. After a second round loss to R. Petrosino, 7-4, 2015 Gulf Coast Tour Champion, Ricki Casper, made an impressive run on the one-loss side with wins over Yvonne Asher, 5-3, Teresa Garland, 5-1, Garza, 5-2, and R. Petrosino, 5-3. On the east side, Sidbury overcame Rocha for the hot seat win, 7-5, while Eaton ended Casper’s run, 5-3. Former WPBA pro Eaton made quick work of Rocha, 5-2, and moved on to the finals. The two seasoned players dug in, and fought to the finish. Eaton captured the first set, 7-4, and although Sidbury attempted to recover in overtime, lost the final set, 5-2. 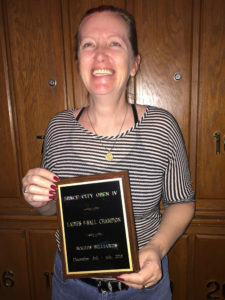 Congratulations to Gail Eaton on her first SCO Ladies 9-Ball title! “Once again, this event has shown a significant increase in numbers and visibility, across the board. Growth is our primary focus, and it takes the support and dedication of the players, fans, sponsors, and pool room, to make an event like this work, and thrive. That’s what gets the job done”, says Kim Newsome, SCO founder and tournament director. Support staff for this event included a number of dedicated individuals including John Newsome, Teresa Garland and Chuck Adams. The Space City Open extends a heartfelt “thank you” to sponsors, vendors, and supporters; Bogies Billiards and Games’ owners David and Shannon Richardson, and their entire staff, Simplified Electronics, APA of North Harris County, Vapor Knights, Ozone Billiards, Zach Goldsmith and “Lucky Luke” Sutliffe with OnSitePoolNetwork.com, Bobby Garcia with RE Visual Concepts, and vendors, Mike McDonald with Vapor Knights, Ron Geyer Cue Repair, Joe Salazar Connoisseur of Custom Cues, and Sean King with King Billiards. Special supporters of this event included Charlie Brown, Mark Stubbs, Chase Rudder, Maurice LeBlanc, Kelly Plunkett, Tom Welch, Doug Stone, Jason Watson, David Taylor, Carlos Sanchez, Willie Duran, Dave Ford, David Hardee, Dennis Perry, Adam Cooper, Fabian Gardin, and Erica Nicole Walker. Space City Open V will take place December 1st-4th, 2016. For more information about the Space City Open, visit www.SpaceCityOpen.com or email spacecityevent@gmail.com. 5th-6th Sylver Ochoa, Tom Mooney 520/1,120 ea. 7th-8th Tony Chohan, Chip Compton 420/790 ea. 9th-12th Abel Lara, Tommy Tokoph, Jamie Farrell, Shane McMinn 275/440 ea. 13th-16th Gabe Owen, Charlie Bryant, Jamie Baraks, Clint Freeman 180 ea. 17th-24th Bobby Perez, Jeremy Jones, Erik Renteria, John Lassek, Mike Massey, Richie Richeson, James Davis, Jr., Joey Gray 60 ea. 5th-6th James Davis, Jr., Manny Chau 210/470 ea. 7th-8th Gabe Owen, Robb Saez 100 ea. 5th-6th Shane Winters, Manny Chau 150/290 ea. 7th-8th Cliff Joyner, Robb Saez 70 ea. 5th-6th Robyn Petrosino, Marie Rodriguez 75 ea.